AVReturnedDate: Come on Bellingham. Make those drop boxes sing!! Matchback data for 10.28.2014 below the table after the break. This election is a thick book of initiatives, advisories, and charter amendments. Turn out is lagging behind last year. The voter list stands now at 129,639: 467 voters more than it was 12 days ago! 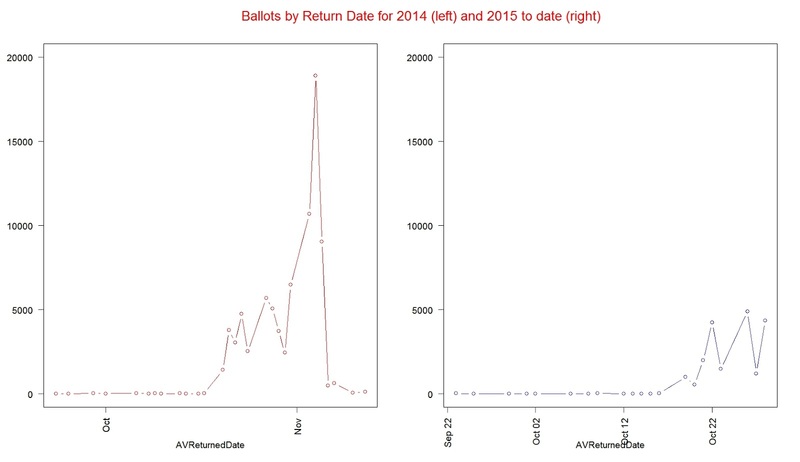 We are looking at 110K ballots outstanding as of this morning, 6 days from the general election. GOTV brothers and sisters! GOTV! "Total Registered (Active) Voters: 129639"